How Much Blood on Gaddafi's Hands? In "Free Libya," people are laughing at Muammar Gaddafi as he goes on and on in a speech, dressed in a traditional outfit called a jard. A dozen men had gathered in a roadside cafeteria in the town of Tobruk, about 100 miles (160 km) from the Egyptian border, to watch the spectacle in one of the few buildings lit up on Tuesday night. The towns here are poorer and sparser than their Egyptian counterparts. But the locals now have the luxury of poking fun at the man who once had the power of life or death over them. "He has a hole in his shirt," one says. "Now he is a poor man!" another shouts. They all laugh. The men feel they can now call falsehoods for what they are. "Gaddafi is saying it's all upside down here right now. But it's not. It's calm," says Fakry Labidi, an activist who helped liberate the area as well as an engineer who works for al-Harouj, a state-owned and partly Canadian-operated oil company. Tobruk is several hundred miles away from Benghazi, the first large epicenter of the revolt, and even farther from Tripoli, the Libyan capital. But local activists felt wired into the revolutions going on far beyond the borders of their nation, even though foreign newspapers were never for sale in Gaddafi's Libya and websites were often blocked, says Gamal Shallouf, a marine biologist who has joined the newly fledged opposition. While the Internet has been down here since the revolution started, the regime's inability to shut down new-media innovations entirely has been key to spreading Libya's revolt. "Generally, in Libya before this, there was no media," explains Shallouf. "So if Tobruk made a revolution, [the government] would spend three to five days killing us and finish the revolution. Nobody in [larger nearby communities and cities] al-Baida or Darna or Benghazi would have heard about it. But now with al-Jazeera and Facebook and the media, all of Libya hears about the revolution and is with the revolution. They know about it. 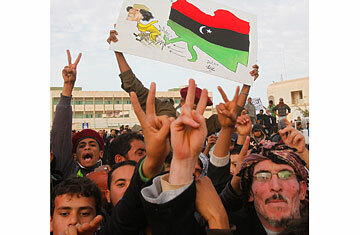 They think, 'I am Libyan, this is my family, so I will go to the street to fight for them.' "
He and fellow Libyans had followed the Tunisian and Egyptian uprisings on al-Jazeera and satellite Arabic-language news channels. He did his best, along with other Libyan activists, to internally circulate the videos he saw so that other Libyans could get a glimpse of what was happening on either side of their closed-off country. "After I got videos from the Internet, we sent them from Bluetooth to Bluetooth. Mostly videos of fighting in Egypt. I felt two things when I saw these videos: I felt sad. And then I wanted to make a revolution!" With the Internet shut down, Libyans crossed the border for access. Says Tawfik al-Shohiby, a chemical-engineering professor at the University of Tobruk: "We sent my brother and his friend to Marsa Matruh [in Egypt] to use the Internet. I went to Egypt every day to give him a flash disk full of media from Tobruk, al-Baida, Benghazi. They were videos from mobiles. Not just mine. We made copies, went to the Egyptian border at Salloum and gave it to someone there  my cousin's son  and he went to Matruh, where my brother was. That was the first media center of the Libyan revolution. My brother [a 31-year-old computer engineer] had this idea. On the 16th of February, he printed flyers for the protest and spread them in the streets from his car." Shallouf recalls how Tobruk was then freed from the regime  the first town to be liberated, even before Benghazi, which has received most of the attention. "On Feb. 17, about 1,900 people took to the streets," he says. "The security was very hard on them. And after that, one or two were killed. On the second day, not hundreds but thousands came to the streets. And when more were killed, the people came out more and more. And lastly, all of Benghazi was in the streets, including women and children." Today in Tobruk and along hundreds of miles of eastern Libya, security forces have disappeared. A few soldiers still wear their uniforms, but they are defectors, says activist Emad al-Maijri. Eastern Libya is in control of the people now, he says. And the people are well armed. "These are citizens, not the army," al-Maijri says. The men, some with their faces wrapped in checkered kaffiyeh scarves, clamor to the car windows, asking to be photographed. Some have AK-47s slung over their chests and shoulders; others flash the V-for-victory sign. "Libya is in our hearts," one cries. The same line is echoed in graffiti on the wall behind him. A battered flag  the new Libyan flag, as people in the east have declared it  flaps in the wind atop a flagpole here. The men are excited to see foreign journalists. "In the days of Gaddafi, I would have been executed for carrying you in my car," al-Maijri says excitedly, speaking of the dictator in the past tense, even though the battle to rid the country of him is still going on hundreds of miles away in Tripoli. In a square in the center of the town of Midan al-Melek, the men are still celebrating on Tuesday night, chanting, milling about and firing off celebratory gunshots. The crowd becomes more frenzied over the sudden presence of foreign journalists; shoving breaks out, and a group of men form a ring around the reporters, linking arms to keep the pulsing crowd from crushing us. We stop our interviews and rush to the cars, sheltered by Libyan activists. "Libyan people are very simple people, because we don't have tourists," says Shallouf. "So when they see foreign men, they want to talk to them and hear them. It's rare for us." He adds, "The crowd tonight was very angry from the Gaddafi speech. He views us like his farm, his cows. And he told us, 'If you don't stop the revolution, I will fight you with the Community of Sahel-Saharan States [An economic union founded by Gaddafi in 1998], with Chad and Mali and Sudan.' And he said all of this is not the beginning of the fighting. But I think it's his last hours. For us, we are laughing at him."